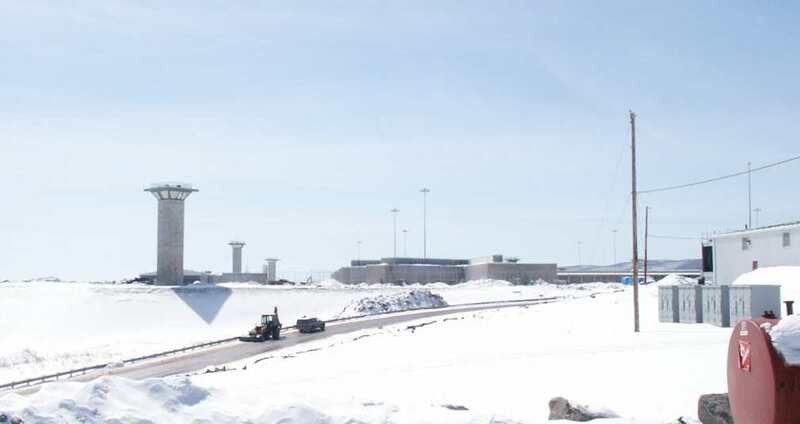 Friday, March 14 - Joe Mitarnowski slipped out of Waymart Federal Penitentiary unnoticed at 11:30 A.M., and was picked up by R. D. Everitt, who was lurking near by. The two picked up Keith Gensel in Archbald, and then proceeded to Kingston, where they met Doc English. The caravan headed west to a final rendezvous with Jeff Dauber and James Mitarnowski near Jersey Shore. After much unnecessary farting around at a convenience store, the group proceeded north-west at a high rate of speed, finally arriving at the Hotel Manor (also known as "Jim's") just before dark. In this photo, which hardly does justice to this fine establishment, Goat Boy and Leaping Gnome can be seen loitering out front, scaring away customers, many of whom arrive by snowmobile. A fine dinner was accompanied by plenty of beer and good-natured roistering. Our comely young waitresses were unruffled by our raucous behavior, although Keith's insistance on having an empty glass did cause some puzzlement. After dinner, the group repaired to an upstairs sitting room, where our exuberant raillery caused the chef to come up from the kitchen and give us the hairy eyeball. Saturday, March 15 - A planned 7 A.M. departure was somewhat delayed by certain members, who dawdled, in the hopes of getting a free breakfast. Keith ordered a pot of coffee, and the innkeeper gladly complied, in the hope of seeing our backs. By mid-morning, we were at the trailhead. 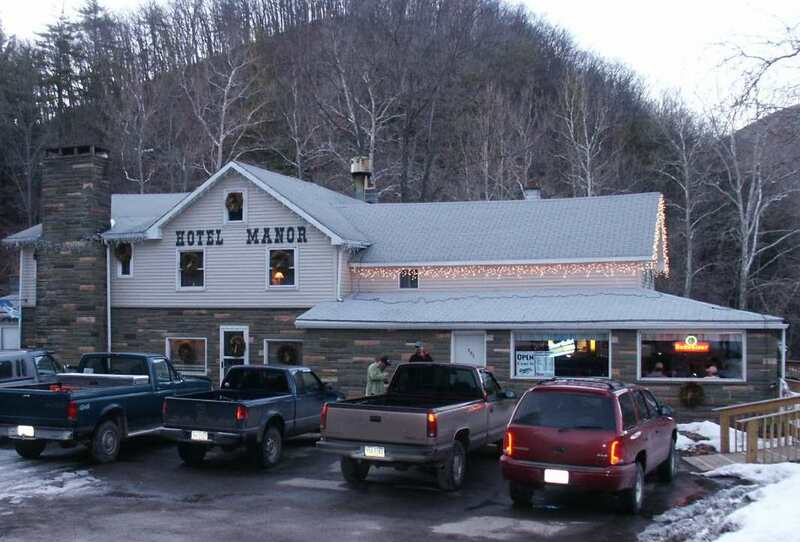 We parked at the Forestry Headquarters on PA Route 44, about 2 miles south of the Black Forest Inn (see map). 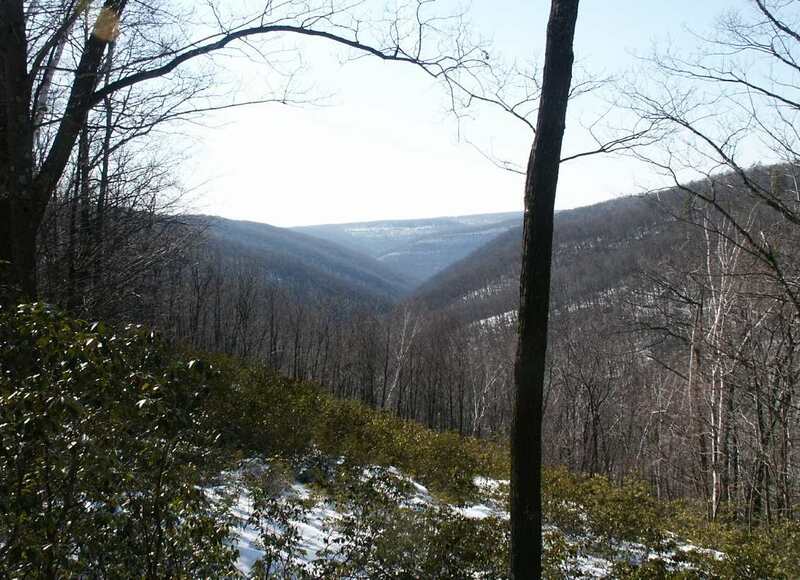 Note: This area can be found on STS Susquehannock Trail Map #4, or in The PA Atlas and Gazeteer, page 48 (extreme NE corner). 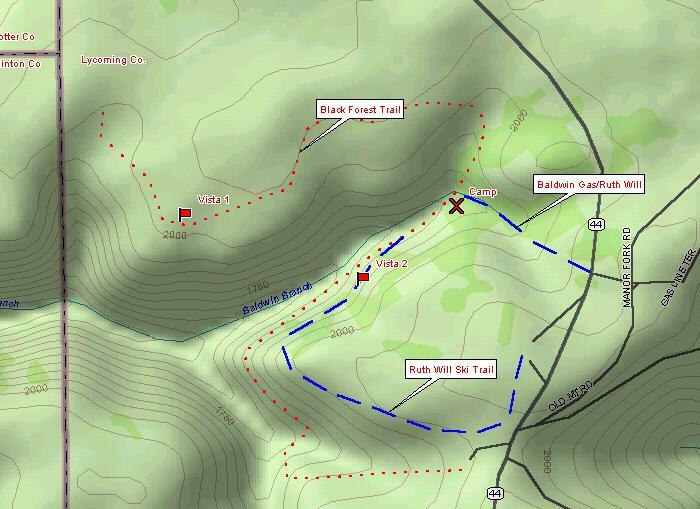 We entered the woods on the portion of the Ruth Will Ski Trail that is marked as "Baldwin Gas Line" on the STS map. We had a 1/2 mile downhill hike to our campsite where the Ruth Will joins the Black Forest Trail. 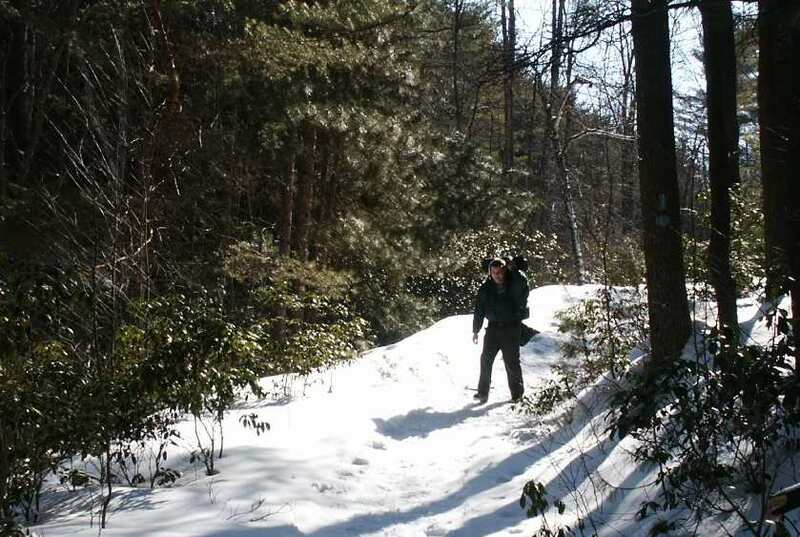 The weather was beautiful, and trail conditions were good, although the trail was a bit narrow for snowshoes. 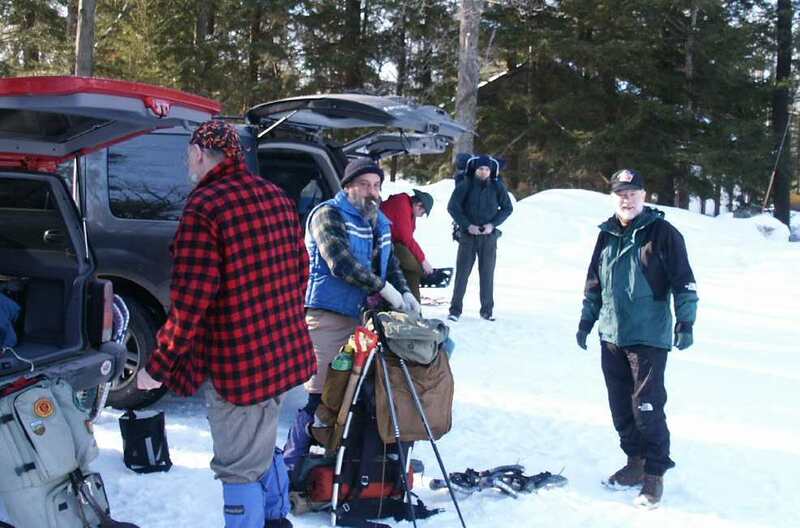 Some of us took off the snowshoes and had no trouble walking. After eating, we spent the rest of the day hiking and gathering firewood. The weather was fine. and the sun was very bright on the plateau above our camp. 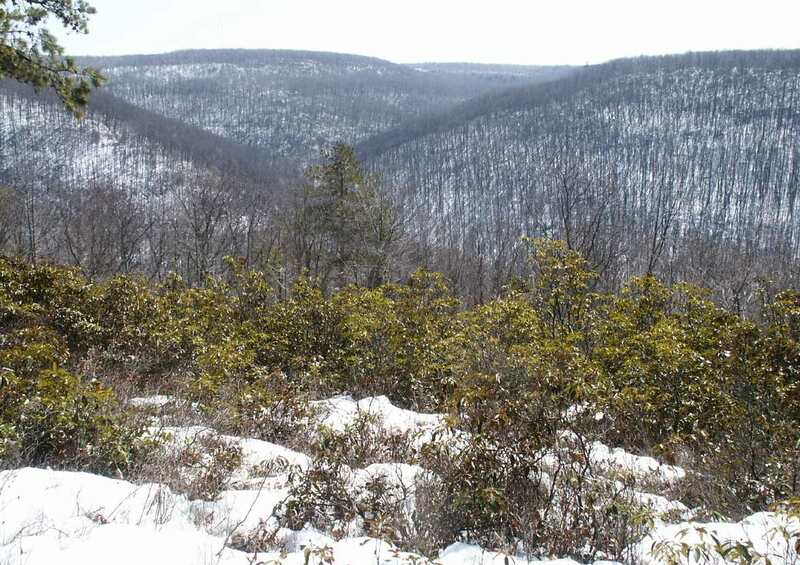 The is splendid view was photographed looking SE from the Black Forest Trail (see "Vista 1" marker on map). In the afternoon, all of us except Joe Mit walked south-west on the Ruth Will Ski Trail, which offered this fine view looking WSW (see Vista 2 marker on map). During this walk, we met a group of youngsters who were hiking in the other direction. We offered friendly greetings, but they seemed strangely reserved as they hurried past us. 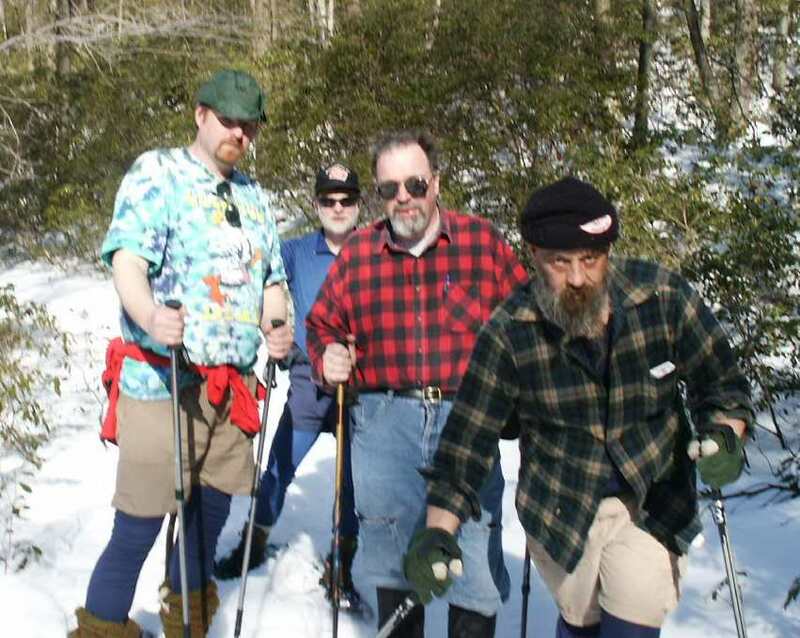 Is it possible that anyone could be intimidated by this group of happy hikers? Some of us completed the loop, and others returned to camp, where Joe Mit was sacked out, and feeling unwell. Keith did his usual fine job making the fire. Much of the evening was spent in cooking, eating, and good cheer, but Joe Mit continued to feel worse, and was soon vomiting (no photo available). By dusk, Mit's condition had worsened, and he was in great pain. He finally decided that he could not spend the night in the woods, and had to bail. He was so bad that he didn't think he could drive. Doc English immediately packed his gear and walked Mit out to the road. James went along to carry Mit's pack, and then returned. Leaderless now, the rest of us were worried about Mit. Those of us who have seen him sick and injured on previous trips know that Joe Mit would not bail out and take another guy with him unless he was very sick. This knowledge dampened our spirits, but Jeff did his best to cheer us with liberal quantities of Black Sambuca. This perscription was particularly effective for one camper, who stumbled over a log sticking out of the fire, and did a complete somersault over a snow bench--much to the amusement of all present, including himself. We later learned that Doc and Mit had a hellacious 140-mile ride back to Wilkes-Barrre, where Mit was admitted to Wilkes-Barre General hospital in serious distress. The initial diagnosis was an intestinal obstruction. Doc stayed at the hospital until after 2 A.M. We are all grateful to Doc English for taking care of our friend. Sunday, March 16 - The night was uneventful. After a leisurely breakfast, we broke camp. 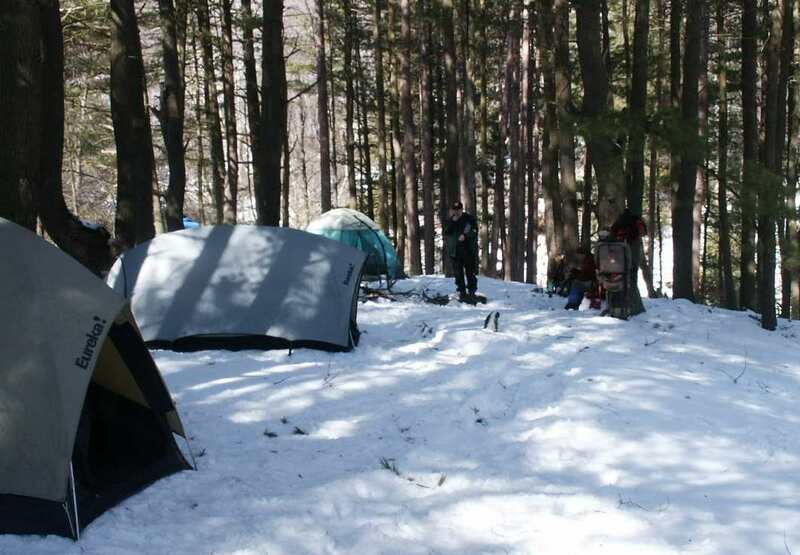 Someone remarked that this was the first Wicky-Wackers trip during which we we slept one man to a tent. We hit the trail at 10:21, overloaded and overdressed. After 30 minutes of uphill hiking, we were back at the parking lot. 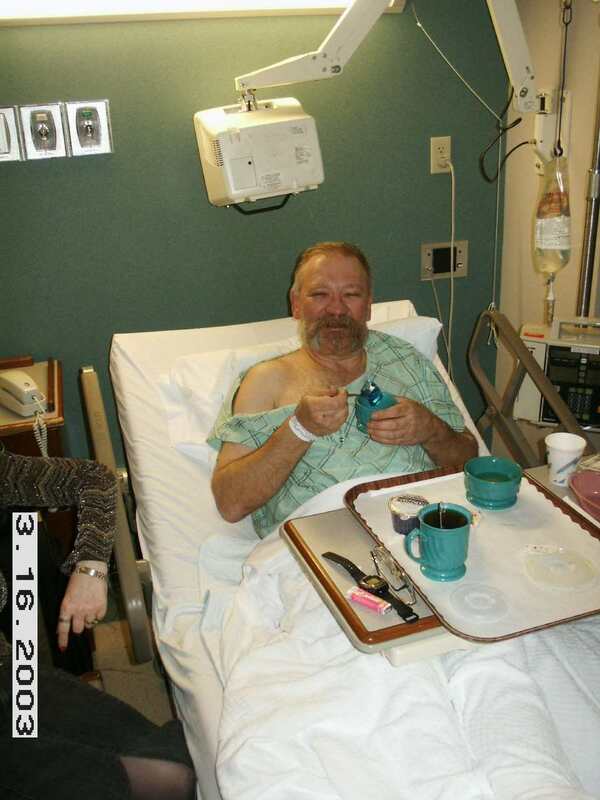 Several of us met up again at the hospital, where we found Joe Mit resting comfortably and eating Jello. We learned that he may have had a gallbladder attack.